Since February 1994, I have been researching in depth the history of the Leverstock Green Area from prehistoric times to the present day. Any information I uncover, (either from pre-published sources including books, maps, press-cuttings, census returns, magazines, directories etc. ; the collective memory of past residents of the village, or from original documents) once collated, is entered into my computer documents on the Chronicle in a strictly chronological sequence, with information concerning the source of each entry. The document thus created is called The Leverstock Green Chronicle. I also have also maintained for over 15 years contemporary press cuttings on the village, and albums of original and copied documents concerning the village. My especial thanks go to a group of ladies who have helped catalogue this information in recent years. Because I felt it important that every item of information could be traced easily by a reader to its source, most entries have at the end a reference in a set of square brackets. This not only satisfies curiosity, but gives recognition to the author of specific theories or information related to Leverstock Green, and enables other local historians and in particular family historians a ready means by which they can trace the information contained in the entry and use it as a starting point for further research. This is particularly helpful when original documentation from the various Record Offices has been quoted. Click here for the list of Source references not listed in full at each entry. Alternatively some of the abbreviations etc. are listed below. Echo - The Evening Echo, publication dates given at each reference. Express - Hemel Hempstead Express; the Express is the free paper produced by the H.H.Gazette. Date of publication given with each extract. 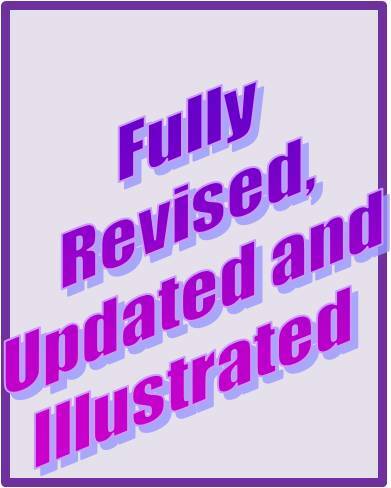 Gazette - Hemel Hempstead Gazette ; publication dates given with each extract or reference. GORHAM - Schedule of Manorial Records - Gorhambury Collection. This refers to information taken purely from the catalogue of documents from the Gorhambury Estate, held at HALS rather than from the specific document(s). If the document itself has been used to obtain information then it will have its own source reference detailing the reference number at the Hertfordshire Record Office. HALS - Hertfordshire Archive and Local Studies - previously known as the Hertfordshire Record Office. The reference usually is followed by the individual reference number used to locate the document or documents for use in the Sources room. Occasionally where a document is of particular importance, it will also have its own "S" number giving an idea of what the document contains. H.Adv. - Herts Advertiser - date of publication given with each extract. HHH&P - The Hemel Hempstead Herald and Post, publication dates given at each reference. 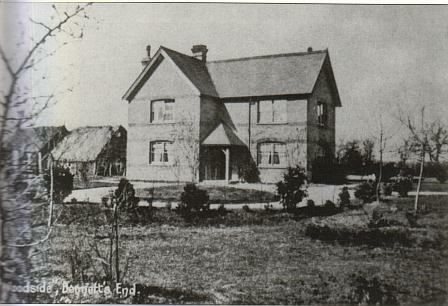 HRO - Hertfordshire Record Office. These references should all have been altered to HALS references, (see above) but the occasional one may have slipped through the net. LGVA - Information obtained from various Leverstock Green Village Association publications and documents, and including advertisements for events displayed in the Village Hall and the various shops in the Village Centre. MAIL - Hemel Hempstead Mail, publication dates given at each reference. VCH - Victoria County History for Hertfordshire, with volume and page reference where applicable. The extracts are reproduced by permission of the General Editor. 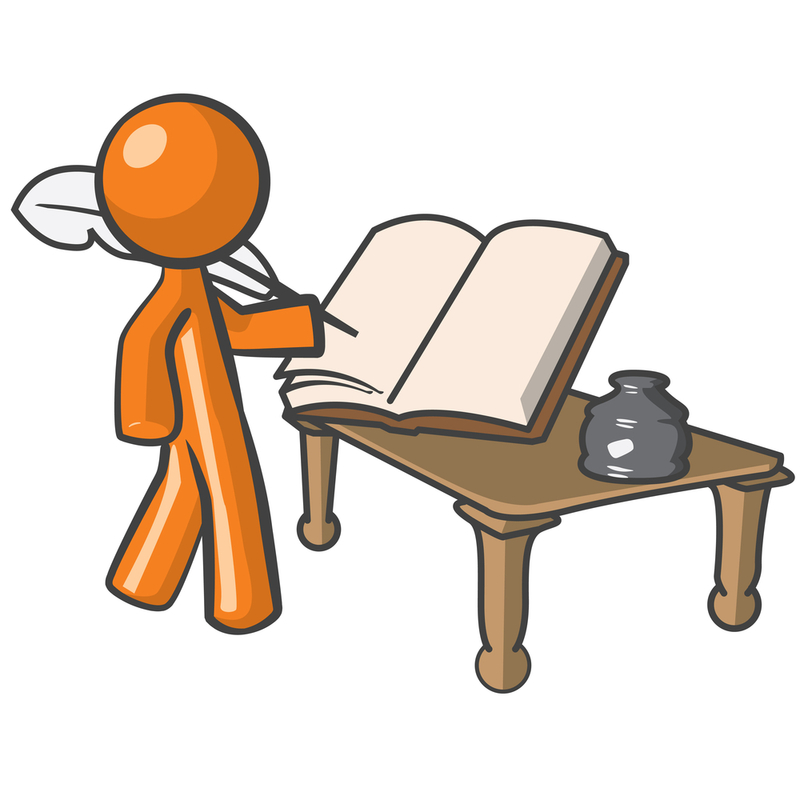 The complete list of source references can be viewed by clicking here, or on Source References in the list to the left. My researches were initially sponsored by The Leverstock Green Parish Trust with the intention eventually of printing enough full copies of The Chronicle to distribute to local schools, the libraries, and the Herts. Record Office. They also hope eventually to publish an edited version of the Chronicle for sale to the general public. In the meantime, the Leverstock Green edition of Chambersbury News, (The parish magazine) publishes monthly instalments of The Chronicle, or individual articles concerned with Leverstock Green's history. For anyone interested in reading what has been published so far, both Leverstock Green Library and the Local Studies Library at Hemel Hempstead have copies of all the information published to date in the parish magazine, along with copies of many of the many transcripts I have undertaken to date of documents held at the Hertfordshire Record Office. As a spin off from The Chronicle, in April 1996 I published a book in the Chalford Publishing Company's Archive Photograph Series, entitled Leverstock Green & Bennetts End ( ISBN 0 7524 0373 7); and at the end of July 1996 staged an extremely well received exhibition on the history of the Leverstock Green area in Leverstock Green Village Hall. More information on my local history research can be viewed by clicking on the various links to the left. 2015 Update: For a variety of reasons I can no longer spend the same amount of time as in the past on my research and updating this website, though I DO still explore our local history and continue to find new historic items of interest. e.g.from http://www.britishnewspaperarchive.co.uk/ which now publishes items online. It is still my intention to update existing pages on the Leverstock Green Chronicle website and to add new information, and I have already made a small start on this. If you have any information relating to Leverstock Green's history and members of your family who lived here, including photographs, ephemera etc.please contact me so I can arrange a meeting and/or exchange email addresses so I can include your information in my archive of Leverstock Green's history. 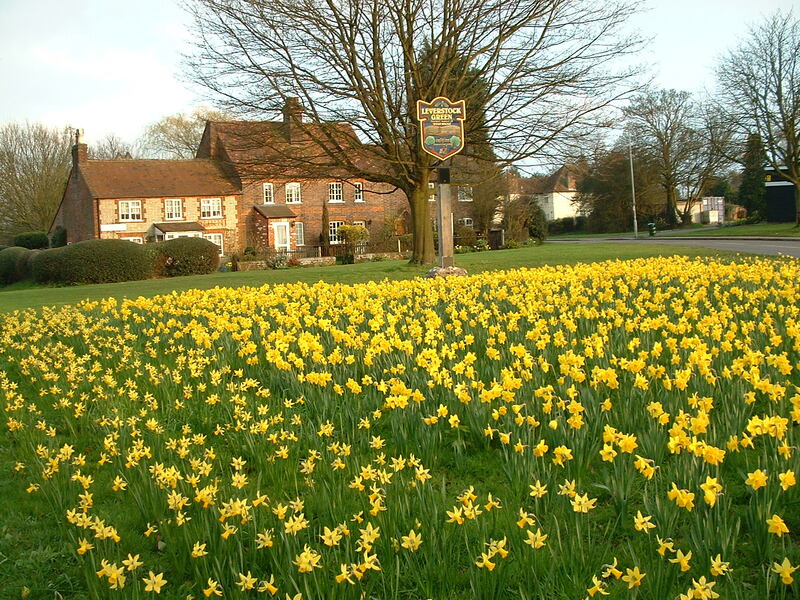 Links to Chronicle texts, maps, and specific items on Leverstock Green's history are to be found at the top, to the left of this page,or lower down. 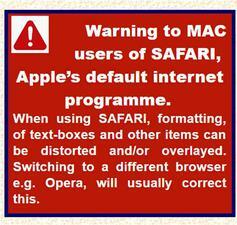 Just click on the item you wish to view. If for any reason a link does not work, please contact me with details. Property, Tenants & Tenure from the Middle Ages to the 19th Century. 1763 - Inventory of the Goods & Chattels of Robert Fellows at the Sign of the Leather Bottle. the Puddephatt family (16th-18th centuries); William, John & Richard Steward; Richard Ginger; William Orchard; Herbert Doult, The Development Corporatoin for the New Town of Hemel Hempstead & others. a link with our past. At 11 a.m. On the morning of Saturday 11 December 1999, in torrential rain and a high wind, I was joined on the green in front of Church Cottages by a fair number of local residents determined to brave the weather and see the new village sign unveiled. Earlier in the week the sign's maker: David Woollacott from Amber Signs of Berkhamsted, had with the help of a local builder, erected the sign on its oak post and flint encrusted plinth. Leaving it tantalisingly shrouded in bubble wrap and a linen cover. Audrey Armstrong having cleverly made a loose cover which I could quickly remove at the correct moment, the bubble wrap had been removed earlier in the morning. However, the driving rain had shrunk the knots in the bow, and removal wasn't quite as instant as we'd hoped! However, success wasn't long coming, and after gathering around the sign so the Gazette photographer could do his stuff, we all gladly retired to the Village Hall for a warming glass of punch and a mince pie. Several people then asked me the significance of the wording (other than the village name) both on the sign and the brass plaque fixed to the base of the oak pole and asked if I could put a piece in the Parish Magazine explaining. Agreed to by the members of Leverstock Green Village Association Committee the general design for the sign ( a pencil sketch) complete with its wording was mine. The idea coming from the numerous pictorial village signs to be found throughout Norfolk. The only significant difference between my original sketch and the finished sign being a carved wooden boss in the style of Grindling Gibbons denoting an acorn and several oak leaves atop the shield. My intention when drawing up the original design was to indicate Leverstock Green's heritage of the last millennium so that it doesn't get forgotten with all the changes life in the twenty-first century will bring. A reminder that we are not the only generation to have lived and worked in Leverstock Green. Despite being given a fairly free hand with the design, Teresa Woollacott of Amber Signs chose to use my idea as the basis for her design, but I think you will agree, has transformed it with jewel-rich colours into something really striking. The wooden boss proved impractical, but the shield's outline was altered to allow for a painted version. I understand sand blasting to have been the main technique used to create the translucent quality of the paint. It should also make it more durable to the elements. The acorn and the oak leaves were important for several reasons. 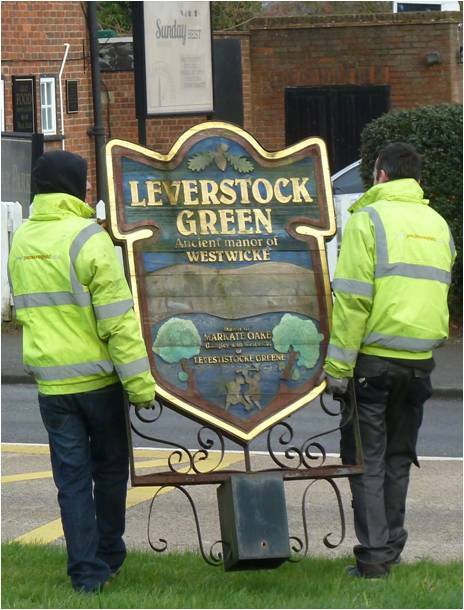 Firstly they are already used as part of the logo for Leverstock Green School - reproduced on their sweatshirts - so the image in association with the village is already established. Secondly, we are now part of Dacorum Borough Council, and again, their logo incorporates acorns and oak leaves. Finally, one of the aliases for the 14th to 17th century tiny Manor of Leverstock Green was Market Oak (or more often Markate Oake). Several of the original fields along the Bedmond Road have the name Market Oak incorporated in them, and during the latter part of the last century and the early part of this, an ancient Oak Tree, standing along the edge of the Bedmond Road was known as THE Market Oak. Sometimes straw plaiters would sell their wares beneath its boughs (according to hearsay) and there is a reference in the school log book in 1864 "Thursday 3rd (October)- Market day - Very cold - let the children go for a run as far as Market Oak." From Saxon times to the abolition of manorial courts in the 1920's, the Manor of Westwick was the principle manor of the village. The manor as a whole stretched from Green Lane in the west to Pimlico, and incorporated Potters Crouch Gorhambury and Pre. Indeed for much of its history following the dissolution the names Gorhambury and Westwick were synonymous - or almost. 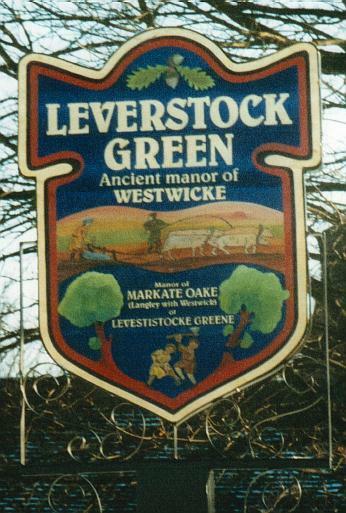 The name still survives along Westwick Row with Westwick Farm, Westwick Cottage, Westwick Warren and Westwick Row Farm; and indeed we have two Women's Institutes in Leverstock Green: Leverstock Green WI and Westwick WI. Westwick was important in medieval times as it supplied the wherewithal to keep the Abbey at St. Albans supplied with all its needs for the refectory, either in kind or in funds from timber etc. Westwick's chief crops were arable, and a huge tithe barn was situated along Westwick Roe more or less opposite today's Westwick Warren. We now know that, for some of the time at least, Westwick's manor house was situated at Westwick Cottage (some parts of which when dated from some of its timbers proved to have been built between 1184 &1219) These facts persuaded me to show medieval peasants ploughing the land, as almost all of Westwick's land was under the plough at this time. The bottom half of the sign shows medieval peasants felling trees. 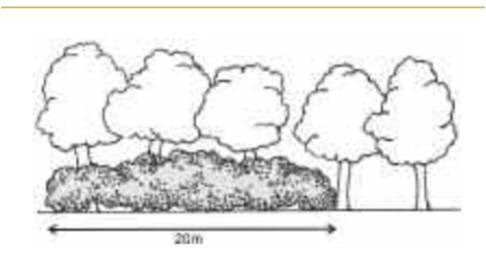 This seemed appropriate on several counts, as in the early middle ages much of the land which had become encroached on by woodland since the demise of Roman rule, would have had to have been cleared in order to reveal the good arable land beneath. In addition, the word "stoc" means a tree stump. It is possible that the name Leverstock Green refers in some way to a tree stump. We know from old documents that assarts had been created - that is land where the trees were felled, and woodland cleared. Leverstock Green proper was in fact just a green - i.e. A stretch of common land on either side of the straight Roman Road, and ran from where Church Cottages are now to High Street Green. The village (as it was before the changes caused by the coming o f the New Town, ) grew up from the 17th century at the point where the roads diverted towards Watford and St. Albans, with settlement still remaining (as it has to this day) along Westwick Row. proud of its own identity. We have documentary and archaeological proof that people lived and worked in the immediate area of Leverstock Green from the time of the Roman occupation onwards. Recent research indicates that settlement along Westwick Row may well date back even further to the Iron age and perhaps the Bronze Age. It seems quite likely that this settlement was a "suburb" of the major Iron Age settlement at Pre Wood just outside St. Albans. We will continue the tradition of the last two millennia into the third. I hope Leverstock Green's residents will come to feel as proud of this symbol of Leverstock Green's identity as I was when I unveiled it for all to see. Chairman LGVA & Local Historian. Daffodils planted autumn 2002 by LGVA. All photographs and scans of HALS documents shown on this website are published here with the kind permission of Hertfordshire Archives & Local Studies. RIGHT: Feb 6 2016 sign removed for renewal. Click the g+1 logo above to a) leave comments and b) recommend this site to Google and/or individuals via their email.